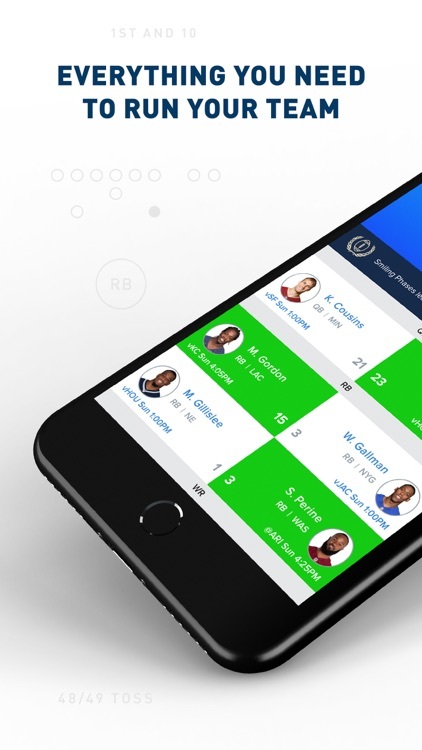 Get your daily fantasy sports fix with these apps designed to keep you up with your teams. All your favorites are here. Never miss a moment or reward. 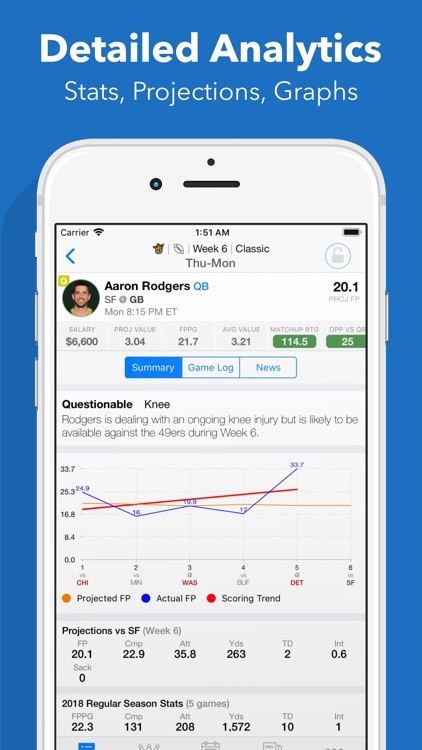 This app from CBS Sports takes you right into all the news you'll need for your fantasy team. 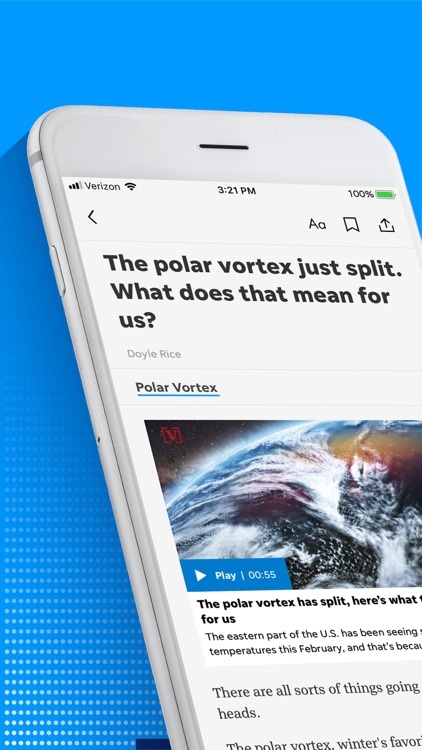 A simple layout and great navigation gets you player news and tons more. 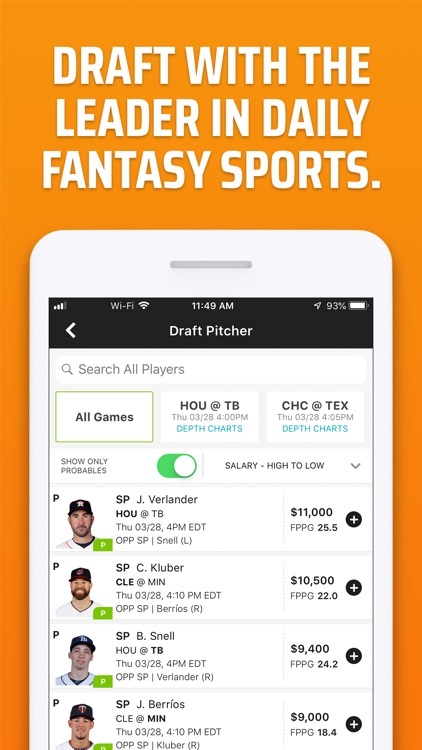 An entire section of the app is dedicated to fantasy advice. 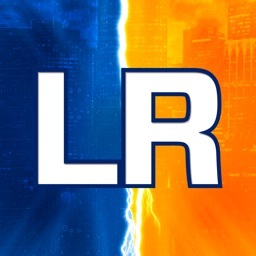 News articles load in-line and there is a decent amount of information. 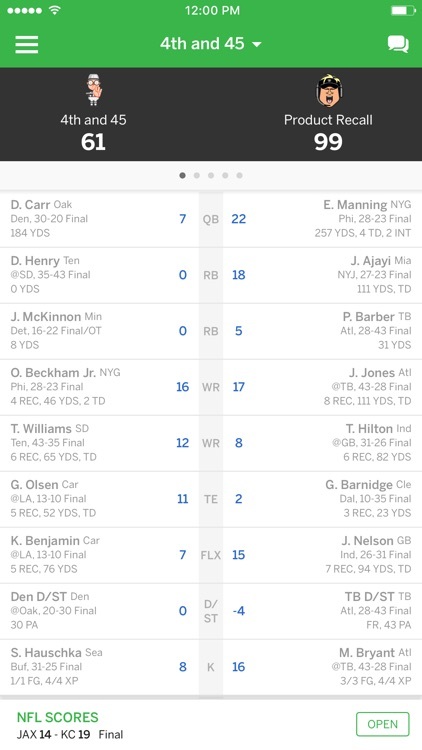 As a fantasy client, it's a bit bare. 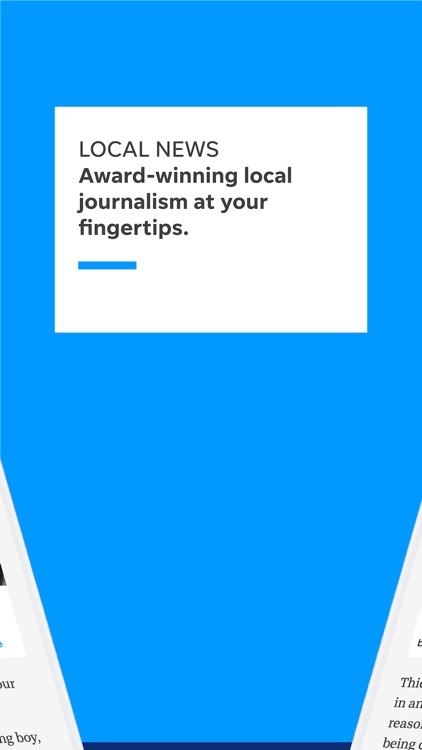 But as a news source, it's a free app that certainly can't hurt. When you think about football, ESPN is likely one of the first news sources you'll name. In addition to running fantasy leagues, ESPN is a wealth of news and information. 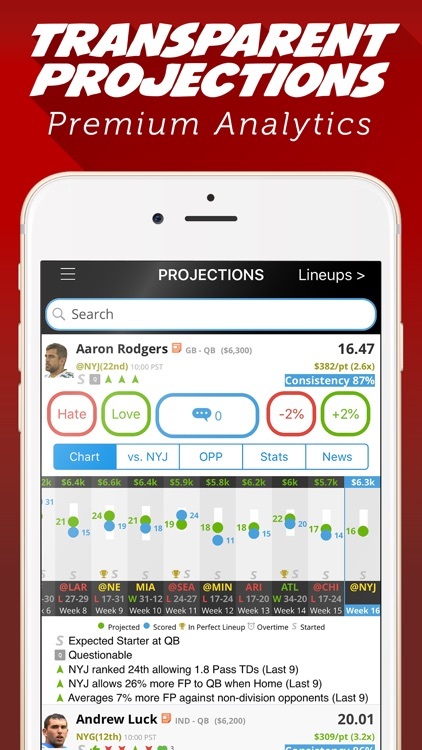 I've always run my friends' leagues through ESPN, and the app has always been average. However, this year ESPN came up big and really pushed the envelope. 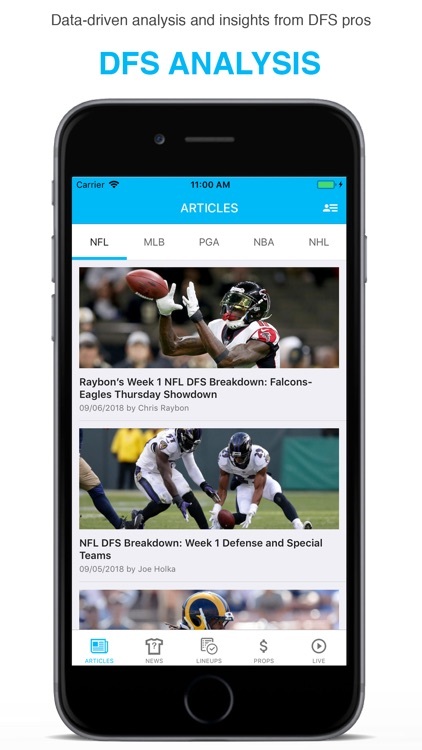 The app is beautiful with well-organized news stories, fantasy advice and articles, and helpful videos to get help you pick that FLEX position. 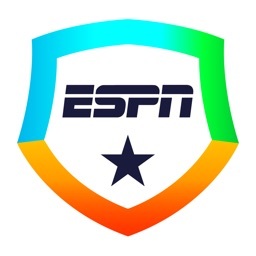 Of the three biggest clients to host your league on, ESPN deserves it this year. 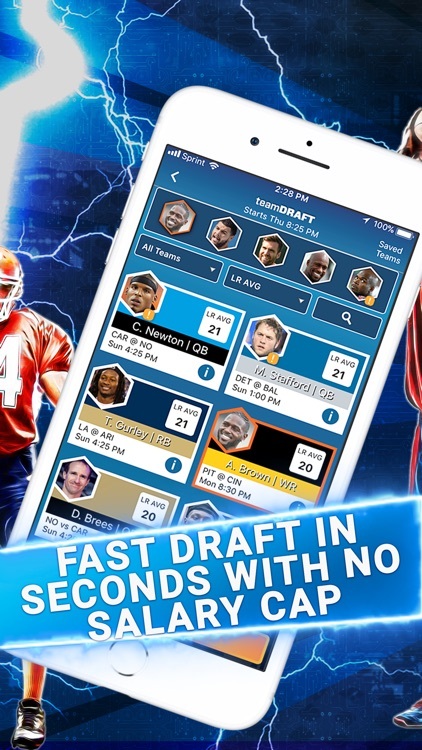 Compete in live Snake Drafts for real money against other people. Each contest takes just minutes to complete. 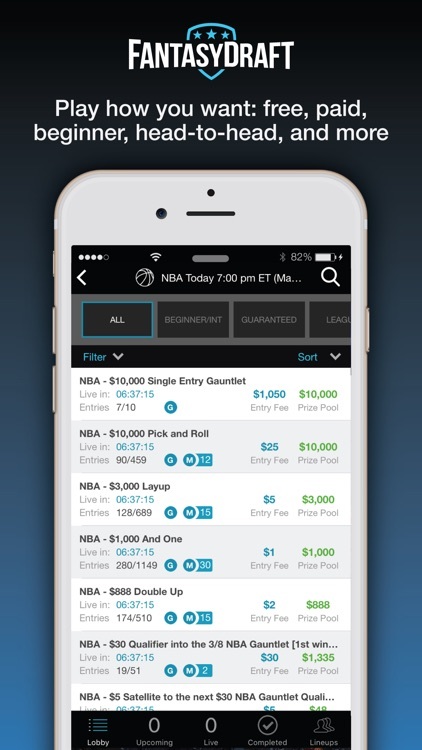 Win cash every day on the highest-rated daily fantasy sports app. 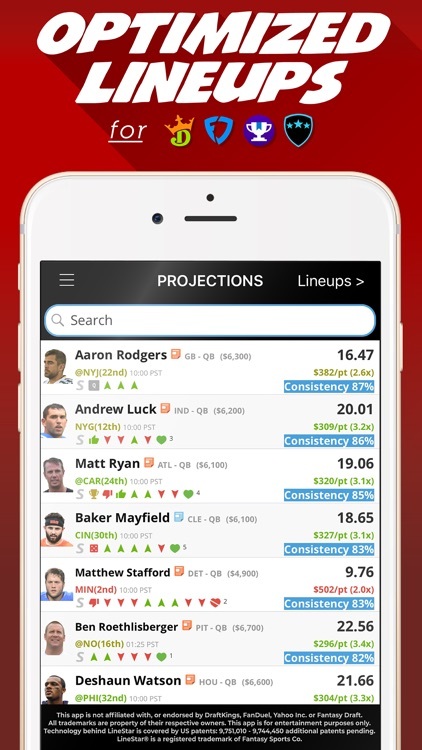 LineStar® is the #1 Companion App for DraftKings, FanDuel, Yahoo Daily Fantasy, and Fantasy Draft. 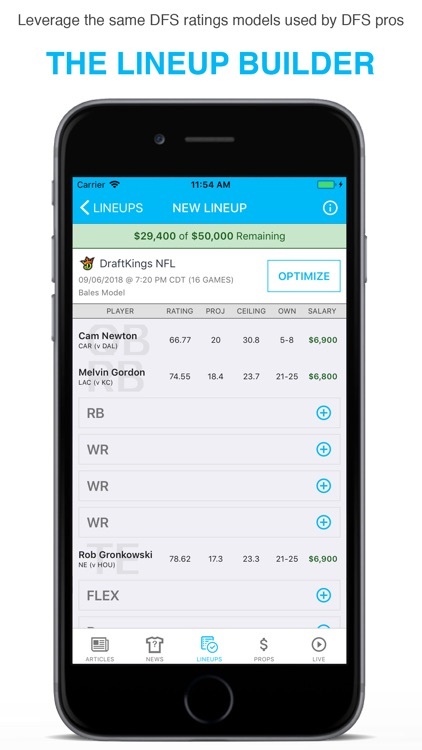 LineStar helps you make the best possible lineups for your favorite daily fantasy sports through the industries ONLY Patented LineUp Optimizer + Builder. 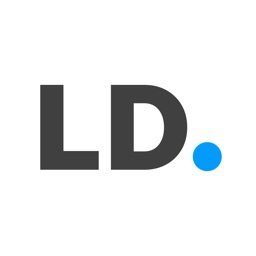 From critically acclaimed storytelling to powerful photography to engaging videos — the Livingston Daily app delivers the local news that matters most to your community. $1,000,000+ up for grabs every day. 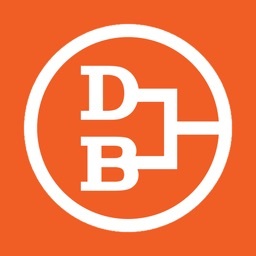 Progressive jackpots and six-figure championship events. 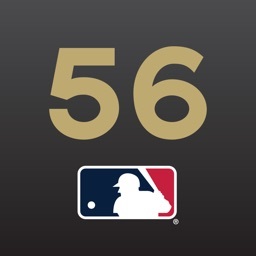 The fastest withdrawals of any daily fantasy site. 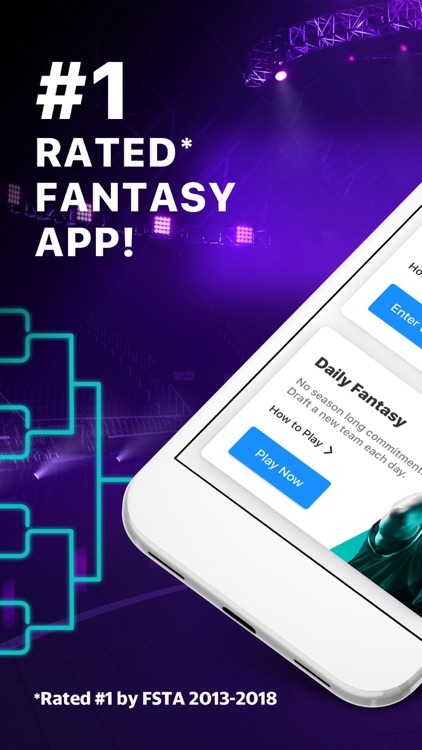 Boom was named the ‘BEST FANTASY SPORTS APP OF 2017’ in the annual eGaming Awards. 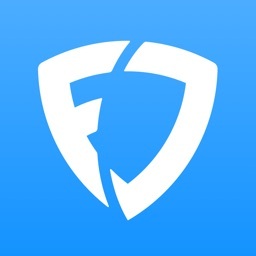 Play Fantasy Sports on FanDuel and win Real Money! 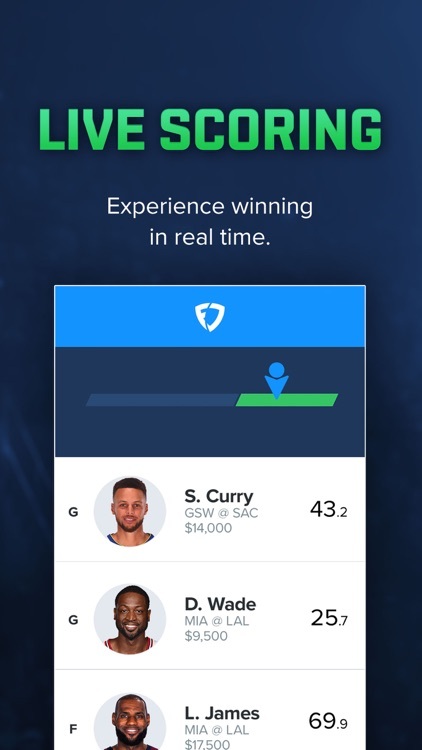 Our Webby Award winning app is perfect for the 2019 Fantasy NBA and MLB seasons, and we have everything you need to get ready for March Madness, Champions League, Golf Majors, Stanley Cup Playoffs and more! 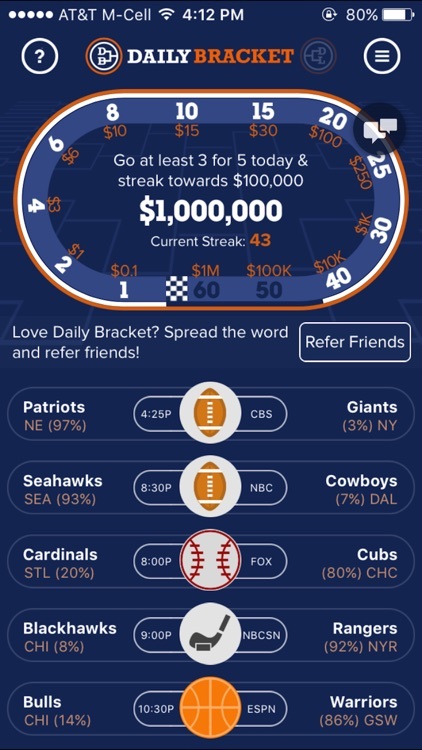 Daily Bracket is the only Sports Pick’em app giving away cash prizes and rewards every day with a chance to win $1,000,000. There is never an entry fee so there’s no risk to play. 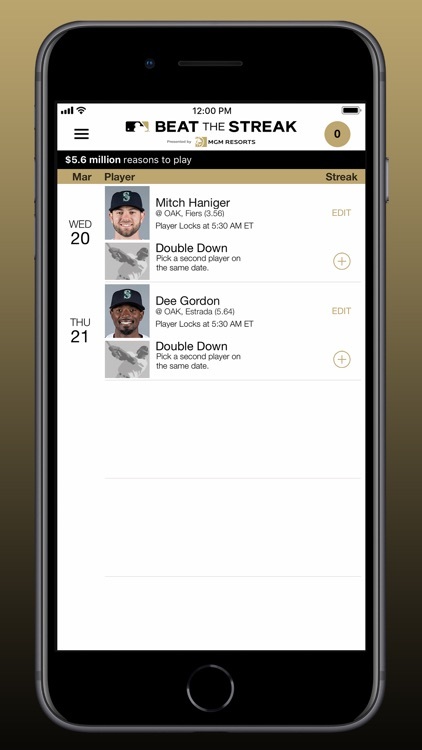 Want to see your favorite football, basketball, and baseball players match-up? 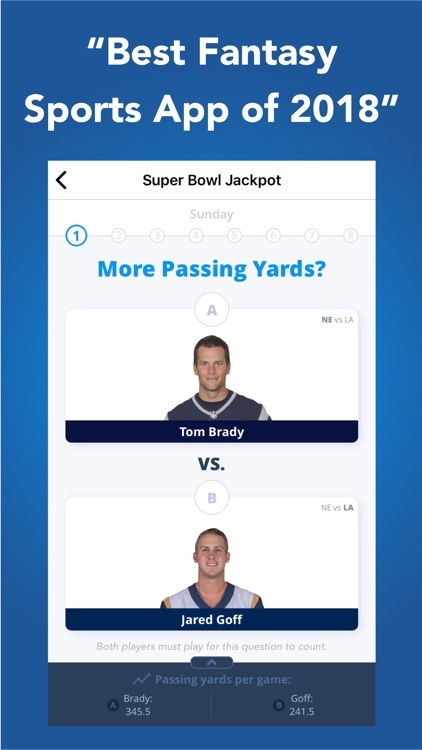 FI uses real NFL, NBA, and NBA stats to create a Daily Fantasy game where any match up is possible. -> Go Pro -> Fast Draft -> Win -> SMAK! 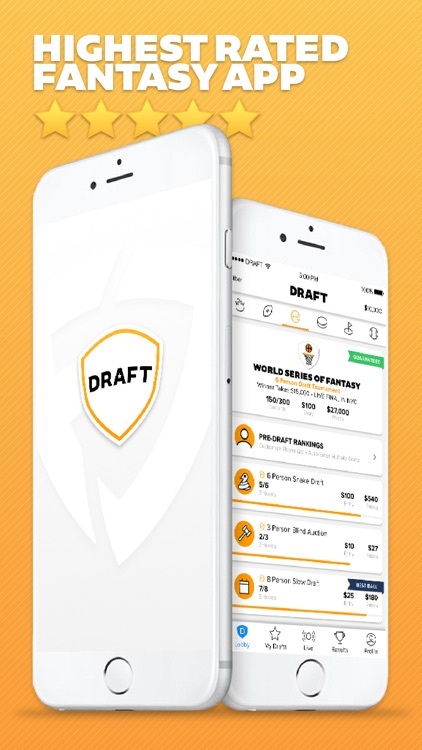 FantasyDraft is daily fantasy sports on a level playing-field. 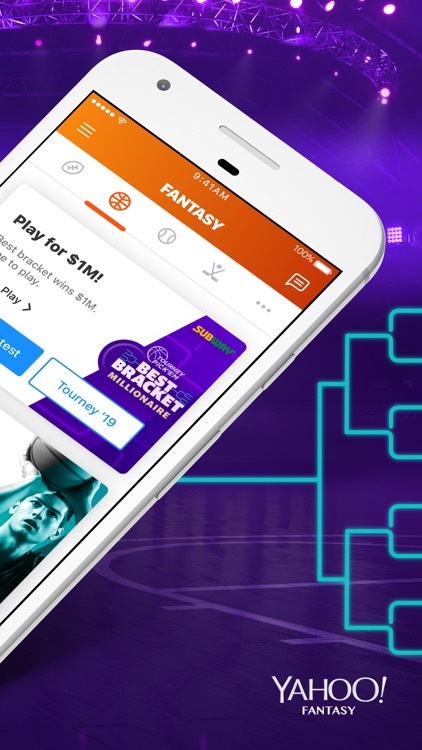 Whether you’re playing football, basketball, golf, baseball, or hockey, our #PlayersFirst philosophy means that we put players over profits, with lower max-entry caps and contest fees, flexible lineup structures, and player-friendly payout structures. 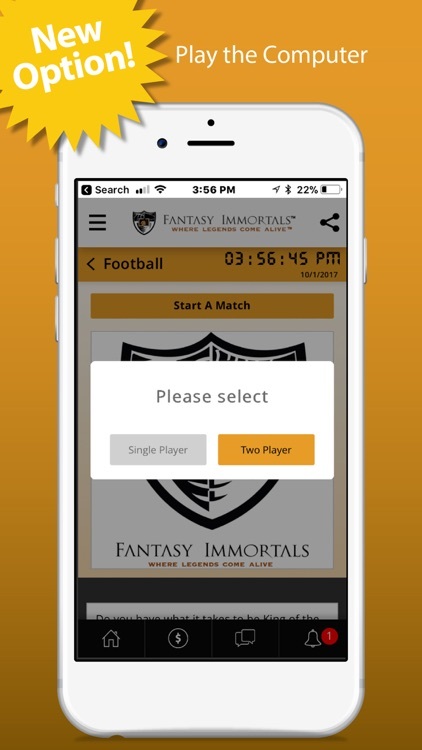 Leading developer of Daily Fantasy Sport with a mobile first approach. 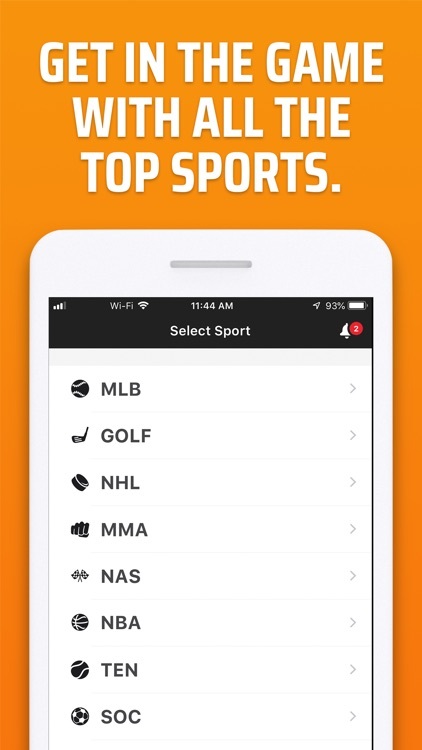 FSport provides contests, based on real life events, for football, hockey and golf among others. Competing in FSport is trying to predict the future. In football, the idea is that participators creates their own "dream team" by picking real players from real football-clubs. Each Team receives points depending on how the selected footballers perform in real life. 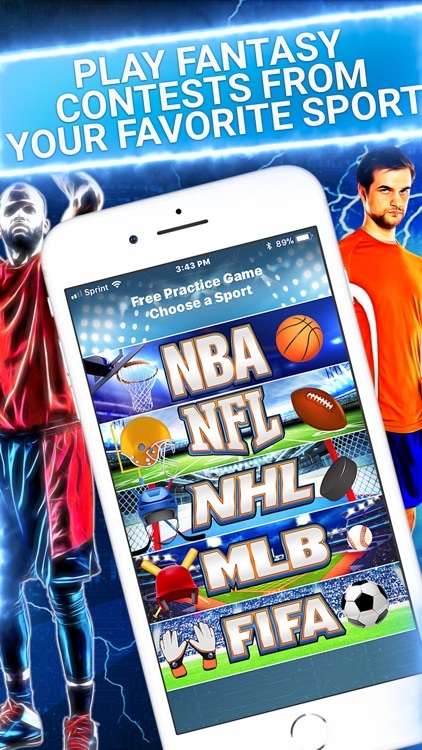 During the football games, all Teams compete in Tournaments to win real money. The whole contest is usually settled the very same day. You’ll just have to do a little better than the average player, to gain success in the long run. We are proud of our high payout rates, around 90 %. In many other forms of games and lotteries, the payback is as low as 50%. 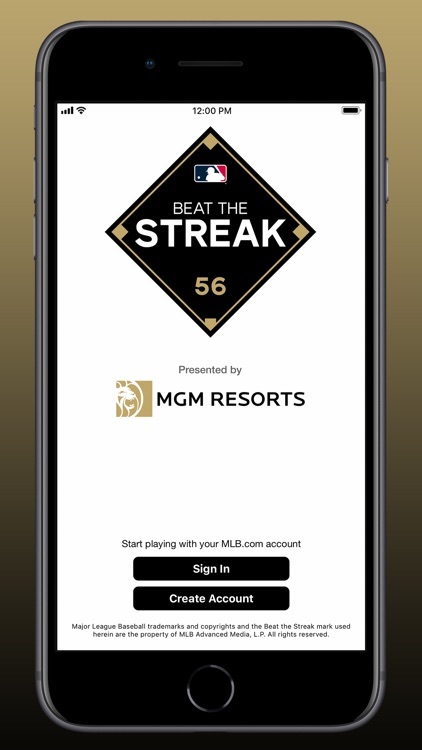 If you want to avoid professional bookmakers, computers and robots, this is the game for you. Anyone can win and everyday offers new challenges. 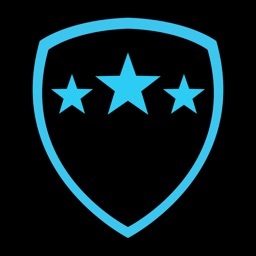 Follow Live and see how your dream team performs. The winner isn’t settled before the very last minute. FSport is the perfect game for many sports. Football, hockey, golf, or completely other events like for example the stock market. Contests are not affiliated with or provided by Apple. 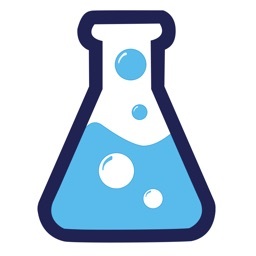 Predictgames Ltd is a Maltese company with headquarters in Valletta, Malta. 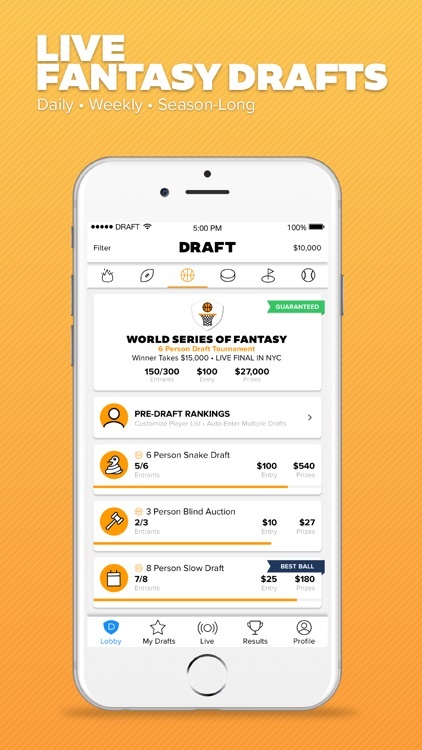 DraftKings gives you a shot at winning real cash prizes playing fantasy sports! 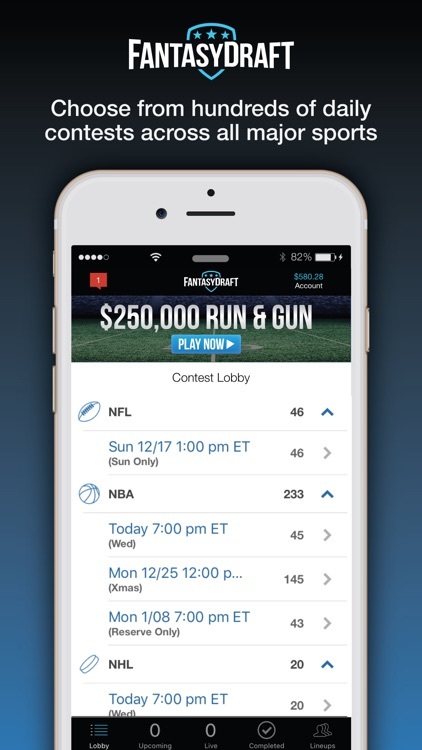 Play for the largest cash payouts in fantasy sports – over $5 BILLION in prizes have been awarded to date! 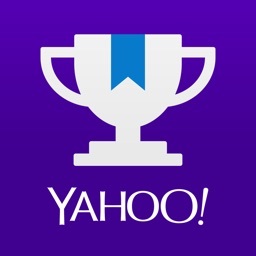 Winners are paid out immediately after a contest ends. 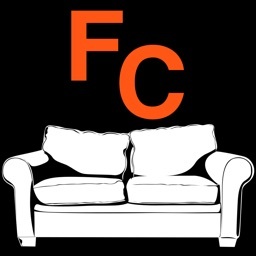 Join for free, choose your sport, and play with friends or other fans. 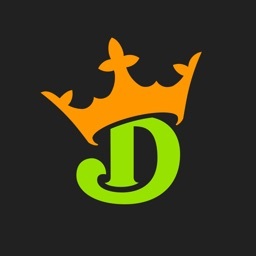 DraftKings is a leading provider of daily fantasy sports. 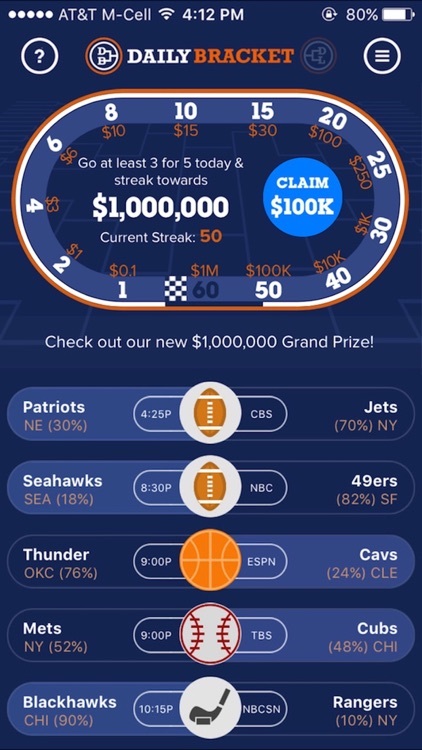 We have a contest for everyone: play for free for a shot at your share of cash prizes or enter a paid contest for the shot at winning even more. 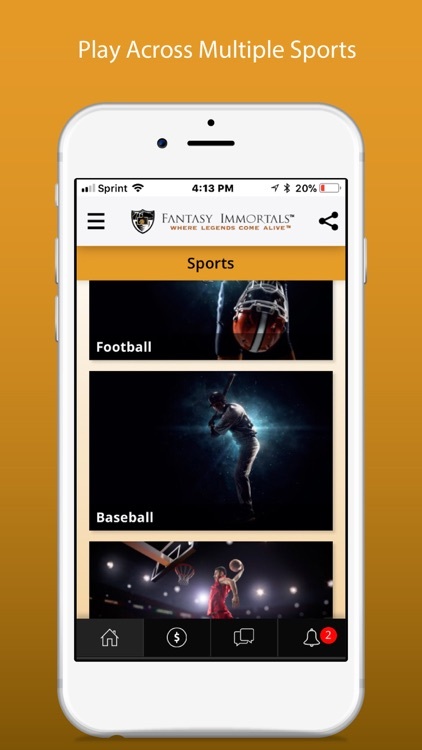 Choose from all your favorite sports including fantasy football, fantasy baseball, fantasy basketball, fantasy NASCAR, fantasy golf, and more. No need to worry about the injury bug or draft day busts, there is no season-long commitment. It’s a brand new season every day! 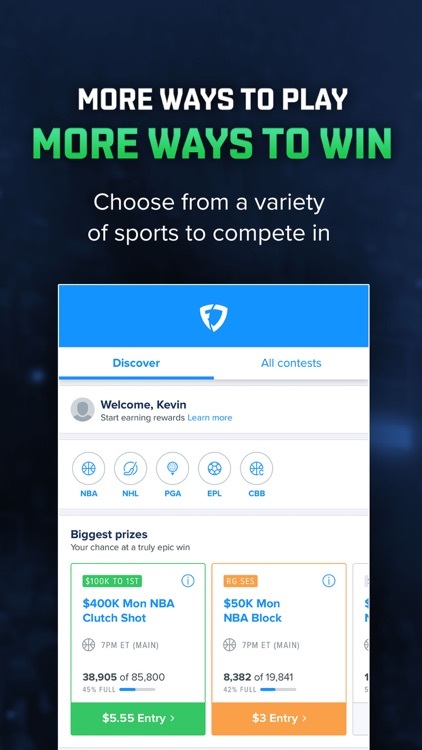 You can even choose who to play against: other fans in public contests or with your friends any time in private contests. 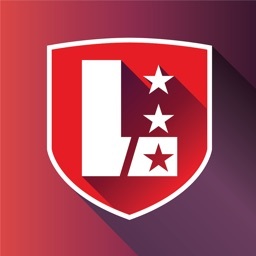 Create your own leagues and track your results in your league's exclusive leaderboards. Play in special Beginner’s contests only open to other beginners until you learn the ropes. Prove your skill and earn experience badges for big wins and other milestones. 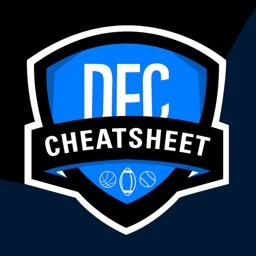 Draft a lineup for all the major leagues: EPL, MLB, Euro League, NBA, NHL, PGA, NASCAR, CFB, NFL, MLS, and more! 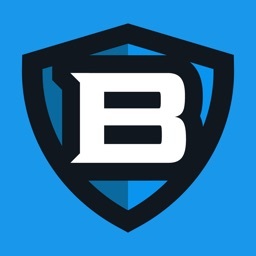 Play fantasy college basketball and fantasy college American football on DraftKings. 1. 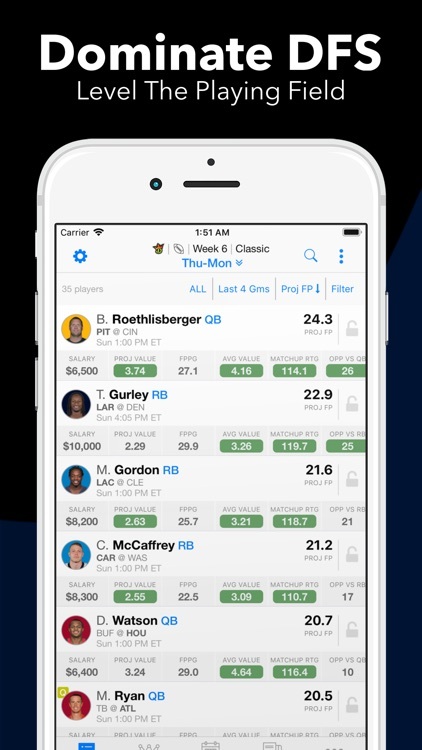 Pick your sport and draft a team of your favorite players while staying under the salary cap. 2. 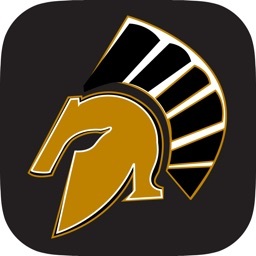 Challenge friends or compete against other users in any sport. 3. 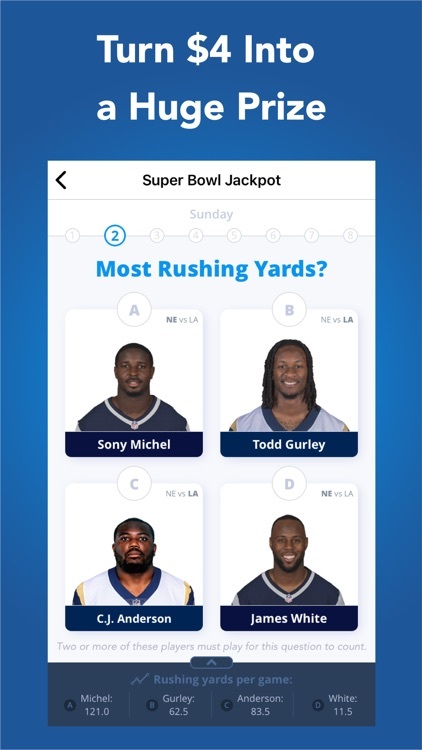 Follow along with your score live as your team accumulates points and win! Contests are not affiliated with or provided by Apple. DraftKings is regulated in the UK by the UK Gambling Commission. 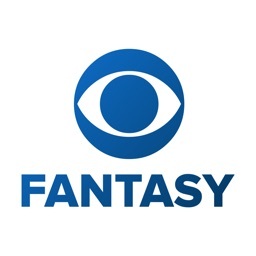 Join our daily and weekly fantasy contests and win free cash prize daily or weekly. You don’t have to play the entire season. Free and paid games available. 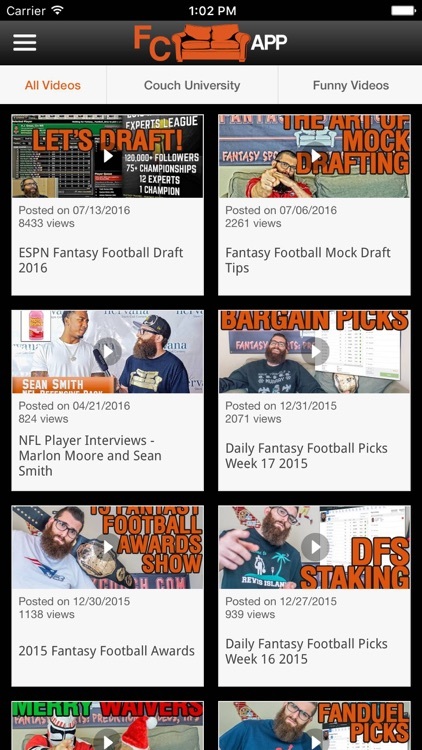 We offer daily fantasy games for horse racing, soccer, football, Euro 2016, sumo wrestling and more. We pay out each week! NOTE: Apple Inc. is not involved in any way in rewarding of prizes and as such holds no responsibility for the choosing of prize winners or distribution of prizes. 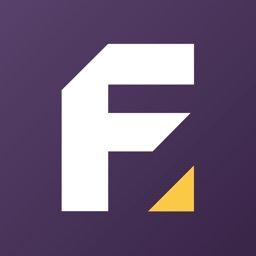 Apple Inc. is not a sponsor of FanXT.